This handmade bag is very detailed. The fabric is stunning. 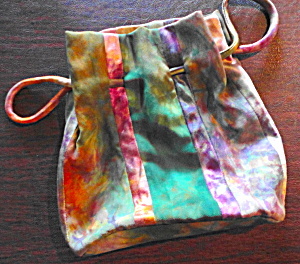 There is a drawstring closure and is fully lined with the same fabric. the purse is 9 in. in height and is 8 1/2 in. wide. The base is 3 1/4 in. by 4 1/2 in.